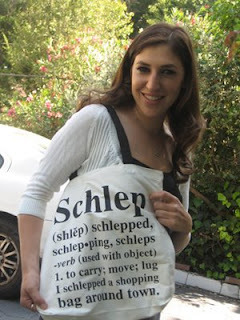 Home › ModernTribe's Blog: Modern Jewish Life & Style › Mayim Bialik's Kosher Comeback! You probably remember Mayim Bialik for her lead role in the early-1990s NBC television sitcom Blossom. Wonder what she's been up to since? After starring in Blossom she earned a BS from UCLA in 2000 in Neuroscience and in Hebrew and Jewish Studies, and went on to earn a Ph.D. in Neuroscience, also from UCLA. Bialik was a dedicated student leader at UCLA Hillel, leading and starting a women's Rosh Chodesh group, chanting for High Holiday services, and conducting UCLA's Jewish a cappella group. She is currently a board member, co-founder, and chair of Jewish Free Loan Association's Genesis branch, and as an avid student of all things Jewish, she studies Torah on a weekly basis with a study mentor through Partners In Torah. Lately, Mayim has been making what can best be described as a "Kosher Comeback." It seemed to have started with an innocent appearance of her Blossom doll in Pop Judaica's Passover segment on the Modern Jewish Mom show. Then there was this post on Jewcy, where she was interviewed about her growing level of religious observance. Today, her Jewish wedding is profiled on Jewish Wedding Network, and this Friday she'll be made over by the folks at What Not to Wear. (Shabbos observant Jews: Be sure to set your DVRs!) Word has it that they make sure to dress her modestly on the show. She'll also be playing a frum woman in an upcoming episode of Saving Grace, so stay tuned! Mayim's interest in Judaism does not seem to be anything new though. We dug up this clip from 1989's Chabad Telethon which proves that even in her Blossom days, she was into mitzvot! Man did Punky Brewster seem a little … um … jumpy. Love it, so 80s, and she is such a cutie! There is also very nice post about Mayim Bilik on jewinthecity.com, hope I can break Challah with both of them one Shabbos!